I took a trip to Science World in Vancouver with the family today (Telus World of Science I should say – and a great place to go with the kids at that), and made the obligatory gift shop stop. While there, I happily learned that holders of yearly admission passes get a fifteen percent discount on everything in the shop. With this new found knowledge, I couldn’t leave empty handed. Come on, how can you pass up 15% off (even if everything in the store is 25% more expensive than any other store, because of the tourist-attraction-factor)? Lets think of it as an early Christmas present. We noticed that Smarty Pants was holding a liquid timer, and was totally mesmerized by it. He had been staring intently at it for the past ten minutes, flipping it over and over, hypnotized. “Gotta get it!” was the first thought that popped into my noggin. (Anything that keeps the kids occupied for more than 10 minutes is pretty much a mandatory purchase in my view). 1) Sharing: Picture this – two kids arguing over a toy (I know, it rarely happens, but just play along with me here), you hop in on the scene, armed with your liquid timer, and hand it to one of the kids. You explain that one of them can watch the timer while the other one plays with the toy… when the timer runs out, they trade toy for timer, flip the timer over, and repeat. 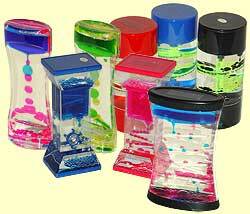 The liquid timer is so mesmerizing, that the kids will be more than happy to comply. This is much more fun than watching the hands on a clock, or the digital numbers on a digital timer. 2) Time-outs: Time-outs need not be filled with boredom or screaming any longer. Hand your kid a liquid timer and tell them that when the liquid runs all the way down, the time-out is over. The liquid timer is so interesting, that it will break their pattern (from the screaming, or naughtiness, or whatever they were doing), and make the time-out more bearable, for you and the child. You should also make sure, before the time-out is over, that your child is ready to get back in action again, of course. 3) Brushing Teeth: When your child brushes her teeth, does she do it for about 2.5 seconds before throwing the toothbrush into the sink and declaring victory? Tonight we sat the liquid timer on the counter and said, “Watch the timer… brush your teeth until the timer runs out.” Smarty Pants was more than happy to stand there, brushing his teeth, whilst watching the timer go. It was amazing. 4) Countdowns: Ever find yourself saying, “5 more minutes” or “1 more minute” or “Right Now!!”? Well, a timer is a great way to make this process a bit less subjective. A liquid timer is a way to make it fun to boot. Next time you want the kids to stop playing and come to the table for dinner (or anything of the like), set the timer down, and explain that when the timer runs out, it is time for them to come. They may get so enthralled with the timer that they’ll forget the reason why they didn’t want to come in the first place. 5) Something fun to watch, and a lesson in science: Our kids are just happy to hold the liquid timer, watch it go, play around with it, and experiment with it. It is the ultimate toy that isn’t a toy, and it really holds their attention. I am sure there is some good scientific explanation on the Net about how it works too. Once I look that up, I’ll have a great lesson in science to share with the kids the next time we pull the timer out. So there you have it. Our liquid timer is really our best friend forever. It provides all the timer functionality we need, and does it in a way that is interesting to the kids. So far we’ve had a lot of success with it, and our bedtime tonight ran really smoothly with it! Looking forward to using it more tomorrow! This post was paid for by the International Society for the Promotion of Liquid Timers. Just kidding. No liquid timers were harmed in the making of this post. Hilarious post (no liquid timers were harmed…hehe)! I’m a Dad Blogger based in Toronto, Ontario and it’s nice to see a fellow Canadian Dad on the Web! Love the myriad ways to use a liquid timer and because of your post, will probably pick one up for Ballet Girl’s upcoming birthday. One additional use for the timer would be to mimic the ’10 second tidy’ from Big Comfy Couch; when the room’s a mess and needs to be cleaned up, make it a race against time for your kids to beat! Keep up the good work and if you have a chance, would love your thoughts and any advice on my site (www.incredibledad.com) from an experienced blogger! Hi Incredible Dad! Thanks for your comment, I agree, its always great to find other Canadian Dad Bloggers out there! I like your idea about the 10 second tidy use for the timer, that would work great, I’ll try it out! I am happy to report that one week later our liquid timer is still going strong and getting lots of use. Take care and I will be sure to check out your site too! Wow, this is a first…. just had to chime in and say that here is another Canadian Dad Blogger! I am just over the mountains in Alberta but it looks like we’ll have to make a trip out west for one of these timers, lol! New here and I really liked this post. I also will be on the lookout for a liquid timer, because my son would totally fall for all of that stuff you mentioned. Hi Daddy Files and welcome to the Jam! Glad you liked the post… if your son is anything like mine, he will totally go for it! I wonder if there’s a way to get a common Canadian Dad badge/banner then put it on our respective sites to list our links to one another? Unfortunately, I have no design ability but that would be neat! Interesting idea, must admit that it is beyond my abilities as well! That’s a good idea… we can list the links on the badge… but I guess we can’t make it link to two or three different sites at once… so it would really be just to show the URLs of the sites. I’ll see if I can do something… I’ll put you guys on my blogroll too! I’ve added the two of you on my new ‘Canadian Dad’ Blogroll and now looking for other Canadian Dad Sites. good stuff, have to pick one of those up! This is nice too because you as the parent are not on time-out watching the clock (and ensuring the child stays where you put her) – good stuff. Thanks Tatiana! Yes, they enjoy watching it, so it works well!